Both Aaron Copland and Leonard Bernstein died in 1990, and John Corigliano, to a certain extent, inherited the mantle, or filled the vacuum left in popular American contemporary �classical� music by the absence of those two great names. Corigliano is unapologetic and resourceful in his use of music from the past, and the ghosts of Beethoven and others pop up on a regular basis. Phantasmagoria is a suite derived from Corigliano�s opera The Ghosts of Versailles, which Norman Lebrecht described as �a great night out, but hardly a momentous work of music theatre�. If Phantasmagoria is anything to go by, the opera is indeed full of wonderful things, but experienced classical/contemporary music fans won�t be hearing anything they haven�t heard before. Dreamscape dripping violins like Dalí�s soft watches, iridescent bowed percussion, harp and winds contrasting with grumpy scraping basses, bassoons and bass-clarinet or twittering birdsong flutes introducing different characters and scenes in the opera. With the music ranging from the sublime to the silly, the most impressive thing is the orchestration, which is indeed �glittering, pitch-dark, kaleidoscopic and inclusive� as the booklet notes describe. To Music is a compact dismemberment of Schubert�s lied, �An die Musik.� Dark chorale strings are topped by Panufnik-like trumpets, concluding with a musical landscape which for me is Hollywood�s "at the hero�s graveside" film music. Fantasia on an Ostinato famously uses a moment from the slow movement of Beethoven�s Seventh Symphony in, as the composer states, an attempt "to combine what I felt were the attractive aspects of minimalism with convincing architecture and emotional expression." Indeed, listeners need not expect the kind of ostinati which Steve Reich uses: the opening is slow and atmospheric, with Beethoven�s funereal basses being suggested as much as stated. The major-minor aspects of the Beethoven theme are explored and extended, developing toward a(n anti)climax in which it is finally stated in full, but with some solidly homespun Americana along the way. Comparing this version to Leonard Slatkin�s with the Saint Louis S.O. on RCA there is not a great deal to choose between them. I prefer Eri Klas in the quieter moments, with his more liquid sounding woodwinds and shimmering strings. While Slatkin can compete with an equally symphonic noise with the tuttis, I get more chills and thrills with this new version. Three Hallucinations begins chillingly with de-tuned pianos, glissandi and high string textures. This piece is drawn from Altered States, Corigliano�s first film score, which accompanies a tale of a scientist�s time-travelling, drug-induced fantasies. While the work is in essence a pastiche collection of the �scary� music effects we all know and love there are many things to enjoy, such as the dripping vibrato of a Hammond Organ, and some wildly distorted references to tunes such as the �Rock of Ages�. 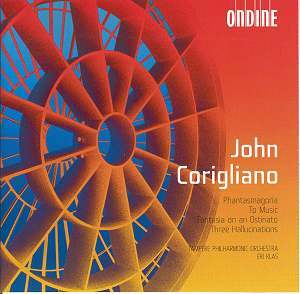 John Corigliano�s music is approachable and, for the most part effective and entertaining. He is something of an eclectic, but we�ve become used to this with American composers such as John Adams. At his best his noises can hold their own in any modern music collection, and at least his music isn�t ridden with artificially imposed intellectual pretension. Ondine have something of a coup in having orchestral world première recordings of Phantasmagoria and Three Hallucinations, both of which are worthwhile additions to the catalogue. Combine this with the excellent playing of the Tampere Philharmonic and a superb recording, and I have to give this CD the full thumbs up.